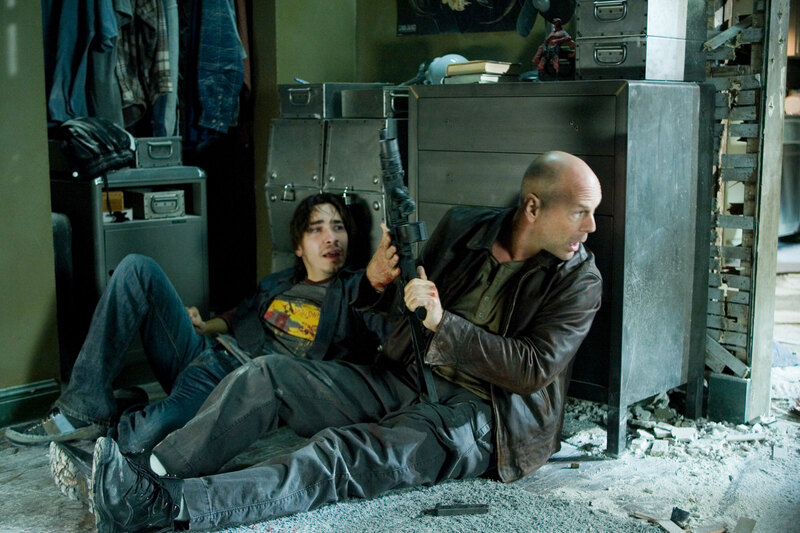 After a long 12 year hiatus, John was brought out of retirement to feature in Live Free or Die Hard, a fourth film in the series, which only promised to up the ante even further under the watchful eye of director Len Wiseman. That’s right. The director of the terrible Underworld films… directed a Die Hard movie. “Don’t tell me,” you’re probably thinking (if you haven’t paid attention to this 2007 movie for the past 6 years), “Kate Beckinsale is in this, isn’t she?” Luckily, I’ll tell you now, no, he didn’t. Then there’s also the fact that they so conscientiously decided to drop most of the harsh swearing featured in the previous films, including that portion of John’s catchphrase about the questionable nature of the villain’s relationship to his mother, as well as some of the more extreme violence and instead aimed for the series’ first PG-13 rating. In case you don’t know, PG-13 happens to be far more easily profitable than R-rated films. I guess that’s a good sign that people pay attention to these things (even if it seems they frequently ignore it). Live Free or Die Hard certainly did make up for the graphic violence by turning up its relatively bloodless battles to the XTREME setting, though. John’s still relatively the same person – a strong-willed, hot-tempered, improvisationally skilled police detective in the same vein as the old school movie heroes of a bygone era – but he’s just older and balder. You wouldn’t know it, though, from his quick recoveries. In the first Die Hard, a floor littered with broken glass makes him bleed so much it nearly gets him killed while also taking a shot at his willpower. In Live Free, he’s ducking cars sent spinning through the air with precision timing and leaping around a crumbling freeway overpass as an F-35 fighter jet fires missiles at him. The criticisms of the film regarding this new superhero persona John’s taken on are certainly understandable. It can easily feel as though Wiseman has forsaken the core everyman hero aspect that was so admirable about the character. Perhaps I’m giving Wiseman too much credit, but I choose to see it from a different perspective – one that makes this far more enjoyable in my eyes than another rehashing of the same scenario, as was the case with Die Hard 2. 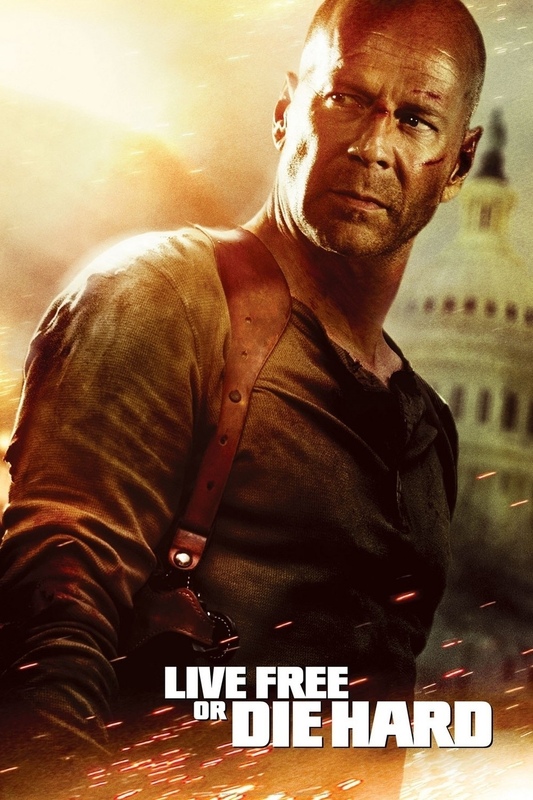 To me, Live Free or Die Hard is a meta-film that pits old school John against all the new action movie tropes that up to that point had pervaded the genre since even his previous, 1995 outing. Think about it: the story involves hackers taking over the computer infrastructure of America on Independence Day (Topical!) and threatening to hit the reset button on the whole system. 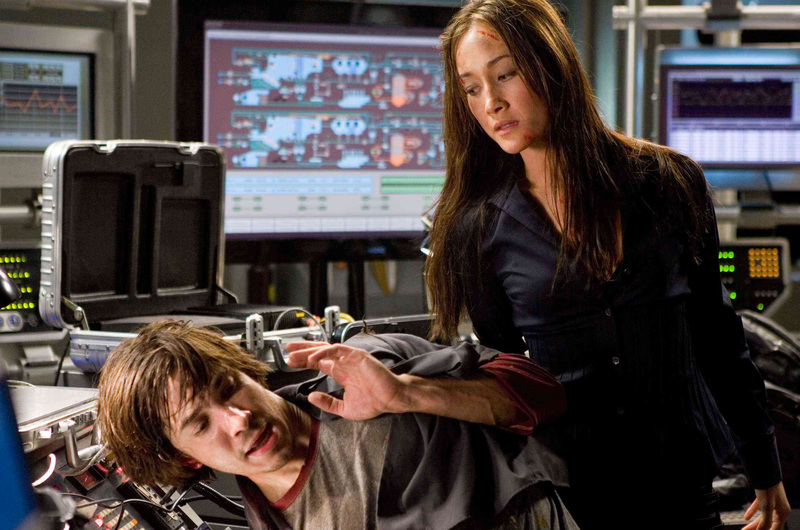 John’s tasked with escorting the lone surviving computer nerd who was employed by these cyber-terrorists and inadvertently helped them achieve their goal to Washington DC. There’s a great deal of humor at John’s expense for his not knowing what the heck is going on with all the computer stuff, along with a lot of banter between him and his nerdy companion over government conspiracies and the merits of classic rock. The foes John faces, apart from hackers who have access to his 401K, include a waify martial arts-knowing Asian henchwoman and a parkour thug who leaps down the sides of buildings and up the walls in combat. And there’s an incredibly heavy reliance on computer special effects, too, including an utterly ridiculous climax involving a jet that will have you on the edge of your seat as well as baffled at how ridiculous it is. This film comes just short of using bullet time, something that had already become tired by 2007. It’s as if John’s been plucked out of his own old school films, given a slight enhancement in stamina, and was placed in another, more modern movie, with the filmmakers seemingly boasting, “Our old man can beat all these fancy and improbable action movie scenarios.” (It’s something that the newest entry, A Good Day to Die Hard, seemingly tried to ape by putting him in a spy movie thriller, with significantly less impressive results.) And you know what? Even if that wasn’t really the intention of the filmmakers, I really enjoy the movie for what it ended up doing, anyway. Think of it more as an in-canon tribute to Die Hard and its own influence on the action genre, and Live Free becomes a far more successful, far more entertaining movie than a lot of people give it credit for. Timothy Olyphant plays the primary villain here, a hacker hotshot with a big ego and intense eyes, but who doesn’t seem to have the gall to stand up against John personally, instead using proxies and computer programs to attack him remotely. Olyphant is no Alan Rickman or Jeremy Irons, but he still makes an impression as a young, handsome, and very likely rich villain who is essentially John’s opposite – save for the sarcasm. It’s pretty safe to assume you know what happens to him in the end, so I feel it’s not necessarily a spoiler to say that, when he does finally come face-to-face with John, all the hacking skills in the world can’t beat the cowboy who gets his hands on a gun. While the first still stands as the best in the series, and the third is an enjoyable return to form, I can’t honestly say I fully grasp the hatred that is often directed at Live Free. Yes, it’s ridiculous and kind of dumb (Why is this yet another film that uses “Fortunate Son” as a patriotic song? ), but it’s also insanely fun, too. When you accept the fact that, by making this a series, you have to accept the ridiculous, you may just find yourself forgiving the film its faults. And if you’re still feeling that it’s too sanitized, what with the PG-13 rating, luckily, the DVD release rectified all this with an Unrated cut that restores all the bad words, completely restoring John’s iconic catchphrase, too. Now that’s a real Die Hard movie.